or however long you need… at the busiest civilian skydiving school in the USA! Learn at your own pace, whether that’s beast mode and completing 25 jumps in a week or a jump here and there as you can. 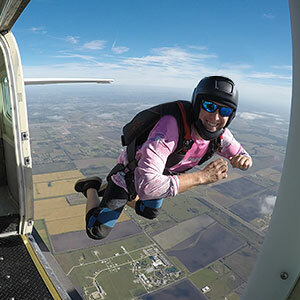 Upon completion of the Skydiver Training Program, you will have completed the objectives required to get a skydiving license from the United States Parachute Association (USPA). 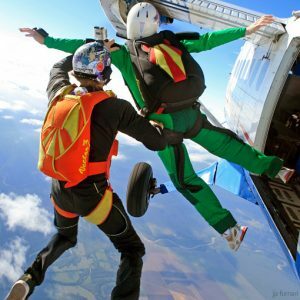 You’ll be able to skydive with your friends anywhere in the world! 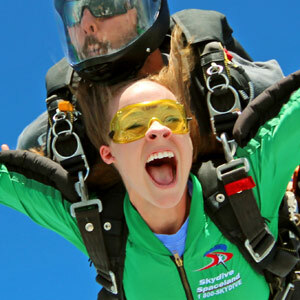 Download our Skydiver Training Program brochure! Have questions about our program or integrating any previous jumps into our program? 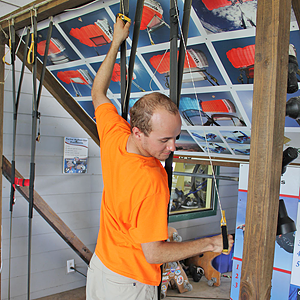 Email our chief instructor and we’ll get you hooked up! After purchase, call us at 512-488-2214 or email us to schedule your training! Get our A License in a Week Package! Buy A License in a Week! No problem! If you get the package, train just as fast or as slow as you like. There will be no extra fees for taking longer to complete our program as long as you remain current by jumping at least once every 30 days. "Magical world of a dropzone..."
I came to Spaceland all the way from Oregon because the 'A License in a Week' program came highly recommended to me by my home dropzone, because I was faced with the issue of not having small enough gear for my tiny self to train with at our local very small dropzone... The experience was incredible. The emergency training and one on one education kickstarted my skydiving passion into one that I can feel excited, safe, and knowledgeable about. My instructor was Ché, who is a total rockstar and has helped me work with my home dropzone to finish my last 5 jumps for my license, and went above and beyond what I would ever expect of an instructor. The rest of the staff was incredible too, and they make even baby skydivers feel like family and part of the community. I left Spaceland with tons of new friends and I am so excited to come back licensed to pursue the free coaching for jumpers under 100 jumps. I will definitely recommend this place to anyone, from anywhere, looking to pursue any kind of skydiver training. You guys rock! Worth coming from any place in the world, near and far, to experience this magical world of a dropzone. "Sincerely interested in seeing me succeed..."
From the first time I contacted Skydive Spaceland Houston to the day that I left the DZ after completing my A-license in a week, everybody there was of the utmost professionals and sincerely interested in seeing me succeed. The arrival and plans were straightforward and explained thoroughly by the lead instructor, Hank. After finishing ground school and completing my Tandem jump, I was assigned Liz as my instructor. She was very knowledgeable and a great instructor that worked long days with me to meet my timeline. On her day off, I worked with another instructor, Fernando, who was also extremely knowledgeable and fantastic at instilling confidence. Throughout my time as a student there, all instructors made themselves available and willingly answered any questions I had. The Manifest office was also fantastic and immensely helpful... Even upon leaving, Hank made sure that I knew I could reach out to him at any time with questions. Great people, great facilities, great equipment! I would recommend to anybody that is already in the sport, or thinking about starting, this is hands-down the place to train! "Most intense week of my life..."
I came to Houston all the way out of Dubai for the "license in a week" program. Managed to do it in even less then a week. At first I didn't take it that serious. I mean how difficult can it be to jump out of a plane and pull on a cord? :p But man man, most intense week of my life probably. A lot of respect for everyone that helped me out to get my license. Thanks a lot guys, hope to see you all again soon! Amazing staff and trainers, if you are looking to do a tandem or do STP this is the place to go. Expectations were far exceeded. "Very supportive and prepared me well..."
Awesome A License training with Francisco Espinosa. Wonderful human being. Super knowledgeable and impeccably safe. The best. Worked also with Rob, Hank, Chris, and Liz. All were awesome. Everyone there was very supportive and prepared me well. Thank you so much. People in the office were awesome. Packers were awesome. Pilot Jason was awesome. Thank you.